I am really excited about my new passionfruit mojito kombucha tea combination. Passionfruit on it’s own is amazing with kombucha and the addition of mint and lime just makes it even more amazing. Lately I’ve been inspired by the cocktail list that my hubby enjoys and have been on a roll with my strawberry mojito kombucha tea (see it here) and pina colada kombucha tea recipe (see it here). I am so happy to be able to share this recipe with you over on Paleo Foodies. Alison over on Paleo Foodies shares the best paleo food and dining experiences around Australia and internationally. There is also an amazing collection of recipes with some of the most amazing foodies, chefs and health specialists. 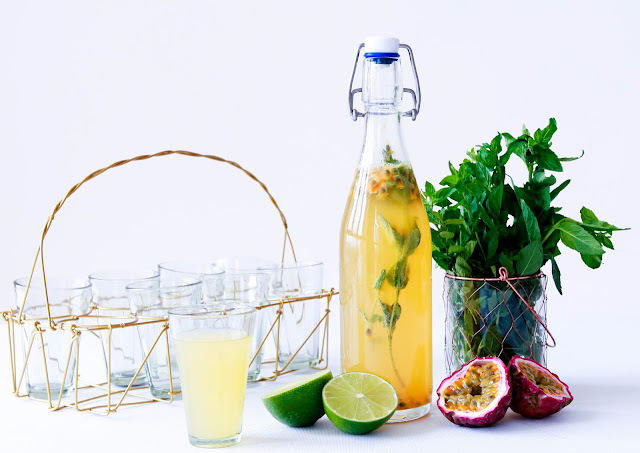 Head over to Paleo Foodies and get the Passionfruit Mojito Kombucha tea. If you are new to brewing your own kombucha, you can click here for more information on how to start brewing your own kombucha at home, how to flavour your kombucha with a second fermentation and lots of flavour inspiration on the recipes page here.